If you have any health issues and cannot run, then no problem, you can always walk. Walking is one of the best exercises for your body. Walking 30 minutes daily will help you to decrease the chances of cardiovascular diseases, reduce body weight, fight osteoporosis as well as keep type 2 diabetes at bay. 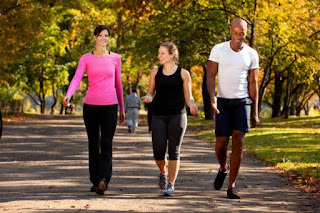 Walking is a simple form of exercise and does not need any equipment. Moreover, you can walk at your own pace and walk at any time of the day. There is no much risk associated with the exercise of walking. In the beginning, you may find it difficult to walk for 30 minutes at a stretch. So, better make small rounds of walk by breaking the time. You may start walking for 10 minutes and then increase the time slowly. In case you are planning to lose weight, then you need to walk for more than 30 minutes and so you need to increase the time gradually. It is very important to continue performing it even after weight loss as you need to regulate your weight from time to time. Make sure you buy a good pair of shoes before you start walking. A wrong pair of footwear can cause blisters, foot pain or injury to soft tissues. It is important to see that you wear a pair of comfortable shoes which support your foot properly. Take easy and light step to make sure that your foot touches the ground properly. Walk on grass rather than on concrete floors, so as to absorb the impact better. 1)Take up different routes every now and then, so that you don’t get bored of seeing the same things again and again. 2)Walk with a friend or family member as it will help you to feel safe and good. 3)Drive to the nearest park or forest reserve and walk there. This will help you to feel fresh and rejuvenated. 4)Look around, absorb things and enjoy the beauty of the nature. At times you may feel alone while walking and may feel the need for companionship. So better plan to walk in groups. You can take any of the family member with you or even plan a family walk. This will help you to spend time together as well as increase family bonding. You can take the kids with you while you are walking. Small kids love to have long walks in the pram. When you are walking with the kids, make sure how much distance you will be covering and which route you will be taking. You need to be extra careful on the routes with heavy traffic. Taking kids in a park to walk can be a good idea, as they will be interested in sightseeing and playing there. You can even call out for your neighbor when you plan to walk, as it will help you to have a company. It is better to consult a doctor prior to walking, if you suffer from any health conditions. 1)Drink plenty of water before and after walking. 2)Wear waterproof clothes, if the weather is wet. 3)Apply sunscreen before going out in the sun as well as wear full sleeve clothes as it will help you from sunburn. Christopher Meloni works as a Marketing manager in a reputed firm Deals lands. He is an enthusiastic blogger who loves to write in his free time. He specializes in topics related to workplace ethics, career development, etc.